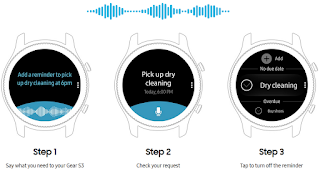 Gear S3 Review Tutorial and Guide - Smartwatches Android were released this year by Samsung, and funnily enough, the only great option for Android users. The Gear S3 watch is the most Android Wear smartwatches. It builds on the Gear S2, and while it hasn’t changed our minds about the usefulness of smartwatches, Samsung makes a compelling case in smart device. Both the Gear S3 Models Classic and Frontier models resemble the Gear S2 Classic, which Samsung released earlier this year. They’re significantly larger at 46mm, which means this watch will look strange and out of place on smaller wrists. The Gear S3 Frontier has a sportier design, is 5 grams heavier, and comes with a more rugged silicone strap. If you want 3G/LTE enabled on the watch, you’ll have to get the Frontier and it will work only on AT&T and T-Mobile’s networks. Classic and Frontier models have a great and beautiful design, especially the S3 looks like a regular watch. I usually prefer classic designs akin to the Classic S3, but the Frontier has more character. The Gear S3 comes pre-installed with same as watch, but the companion app is full of free and great after install Gear S3 App. Gear S3 built in IP68 waterproof rating so you can use it up to 1 meter underwater for 30 minutes. It works okay in the rain, but we had some temporary touch issues the longer it got wet.The Super AMOLED Gear S3 display use 360 × 360 pixel resolution. The always-on display is a must for smartwatches; it dims the screen and leaves your watch face barely visible to conserve power but you can always turn it off to save even more battery. The Gear S3 shows color in always-on mode, builds on its predecessors, and the end result is a good-looking smartwatch that’s fairly durable. The bezel makes a satisfying sound when you rotate it, similar to what you’d hear on a combination lock with a dial. The best Gear S3 features of the watch, you can quickly scroll through anything on the interface. You’re required to tap on the watch screen to complete actions, which is a shame, as we would rather not leave fingerprints on it. 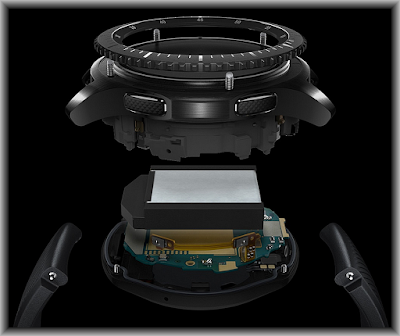 The Gear S3’s interface is simple and has largely remained unchanged from the Gear S2. Just tap and hold the screens to customize this Gear S3. The first screen on the right is where you can access your apps, the phone if you have the LTE variant, S Voice, and the watch’s settings. You can also press and hold the back button to trigger Samsung Pay, press and hold the home button to see powering off options for the Gear S3, or double tap it to bring up voice search with S Voice. You can also triple press the back button to send an SOS alert, but you have to connect it with an ADT app first. From the main watch face, you can rotate the bezel right or swipe to move through various widget screens. Press and hold the screen and you’ll be able to delete ones you don’t want. All the way at the end of the list is the widget creation button, in case you want to add something new. These widgets can range from news stories from Flipboard to music controls. This implementation allows for quick and easy access to the most important information, and it’s dead simple to use. The Gear S3 is compatible with some Android apps, but for the most part, you’re stuck using Tizen apps. With the Gear S3, you can leave your phone and still have complete functionality on the watch. The 4GB of internal storage should be enough to download App, a lot of songs onto the watch, but you can also make calls, respond to texts, or navigate, and built-in GPS. There’s also Wi-Fi so you can connect the device to your home or work network, though you may see a hit on your battery life. Predictade 4 days battery life so don't worry to use it and simply charge with Gear S3 Wireless Carging.